Helen Grace PR for "Colin" on the buzz around the film: "We were almost fainting"
What Price spent $70 on: "A crowbar and a couple of tapes, some tea and coffee"
CANNES, France (CNN) -- A budding British director is enjoying success on a shoestring at Cannes with "Colin," a new zombie feature that cost a scarcely believable $70 to make. 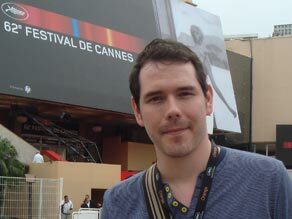 "Colin" director Marc Price who spent 18 months making the film, working nights at a private car hire firm. Japanese distributors are currently in negotiations for the rights to the film and buzz around the no-budget zombie chiller has attracted interest from some major American distributors -- all of which is a very nice surprise for the team behind "Colin." "We were almost fainting at the list of people who were coming [to the final market screening of the film]," said Helen Grace of Left Films who is helping the film's director Marc Price publicize the film in Cannes. "Representatives from major American distributors -- some of the Hollywood studios." "When we say it's a low budget film, people presume a couple of hundred thousand [dollars]. People can't figure out how it's possible. What Marc's achieved has left people astonished." It was by advertising for volunteer zombies on social networking site Facebook, borrowing make-up from Hollywood blockbusters and teaching himself how to produce special effects that thrifty director Price was able to make the film for less than the price of a zombie DVD box set. "The approach was to say to people, 'OK guys, we don't have any money, so bring your own equipment,' " the the 30 year-old director told CNN. With help from a makeshift band of friends and volunteers, Price shot and edited the feature -- which ingeniously spins the zombie genre on its head by telling the story entirely from the zombie's perspective -- over a period of 18 months while working nights part-time as a booker for a taxi company. Online social networking was an invaluable tool in both generating buzz and cheaply sourcing the undead: "We went on Facebook and MySpace and said 'Who wants to be a zombie?' " Price told CNN. "We managed to get 50 brilliantly made up zombies and stuff them into a living room." In keeping with Price's beg and borrow approach, most of the zombie make-up in the make-up artists' cases was inherited from other movies. "One of our make-up people came off 'X-Men 3,' so we were having the same latex that was put on Wolverine," he told CNN. 'Inglourious Basterds:' Has Tarantino lost the plot? Price says he came up with the idea to make a no-budget film because he realized that he and his friends would never be able to scrape together enough money to make even a low-budget film. "A couple of friends were round a few years ago watching Romero's 'Dawn of the Dead,' recalls Price. "And we were lamenting the fact that we could never make a zombie film -- we wouldn't be able to acquire a budget." "Then I just woke up before everyone else -- I was probably a bit hungover -- and I wondered if a zombie movie from a zombie's perspective had been done before." The end result is "Colin," a zombie film "with a heart," Price says, shot using production values cribbed from endless re-watching of making-of featurettes and director's commentaries from his personal DVD collection. Zombie fan Web site zombiefriends.com called it "as original, compelling and thought provoking as [George] Romero's 'Night of the Living Dead,'" while horror magazine SCARS predicted it would "revolutionize zombie cinema." Price hopes that the film will generate enough interest to kick-start his career and allow him to make another film. "Hopefully we'll be able to generate some interest and maybe try to get some kind of a budget for our next film -- maybe a bigger budget, £100, I don't know." Price's cost-effective filmmaking may make him the envy of film executives sweating over whether their latest projects will break even, but even "Colin" may suffer at the market: "In a strange way it's kind of counter-productive." admits Price. "Anyone involved in sales will say, 'Oh, it cost [$70], well how much do you expect us to pay for that?' but with the current economic climate it seems to be a great way to make movies." So, what exactly did Price spend the famous $70 on? "We bought a crowbar and a couple of tapes, and I think we got some tea and coffee as well -- not the expensive stuff either, the very basic kind," Price told CNN. "Just to keep the zombies happy."